INFICON provides technology leadership and applications expertise in areas such as gas analysis, leak detection, vacuum measurement and control, and on-site chemical analysis of air, soil and water. Our products are used in a wide variety of applications and markets. We have a global network of experts to provide fast and local applications and product support. For more information about INFICON, its products, and worldwide network of sales and service locations, please visit www.inficon.com. 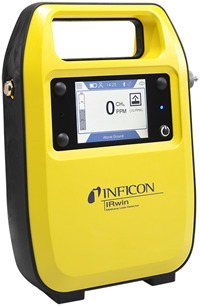 IRwin® Methane Leak Detector is an innovative, portable natural gas detector for easy gas pipe survey and gas leak detection. It is developed in accordance with many national directives, such as the DVGW (Deutscher Verband des Gas- und Wasserfaches) directive. The IRwin SX-models are certified for use in Zone 0, classification Ex II 1G, Ex ia IIC T3 Ga. The integrated proprietary infrared sensor system (patents pending) has a fast reaction and short recovery time. The system prevents false leak alarms and ensures correct and fast leak evaluation. The specially developed Gas Chromatograph (GC) and IR-sensor combination allows fast distinction between marsh gas and natural gas from all known natural gas sources. The IRwin GC gives fast test results, even at low ethane concentrations, from 1000 ppm methane leaks. IRwin is able to measure methane according to the traditional operating modes required by DVGW G 465-4, such as "Inspection above-ground" and "Measuring bar holes". The range is from 1 ppm to 100 Vol. %. IRwin Methane Leak Detector - together with an innovative probe system specially designed for natural gas leak detection - allows for easy and effective survey of gas pipelines. The Mono-wheeler Carpet Probe (patent pending), with optional locking mechanism, has been developed for maximum convenience in all survey situations (under cars, over fences, on gas surface boxes etc).